Hi there! It’s Day 4 of the MFT April Release Countdown! All the new products will be available on Tuesday, Tuesday, April 9 at 10:00 am EDT. This Die-namics is just amazing and can be used to add a surprise element to your cards! 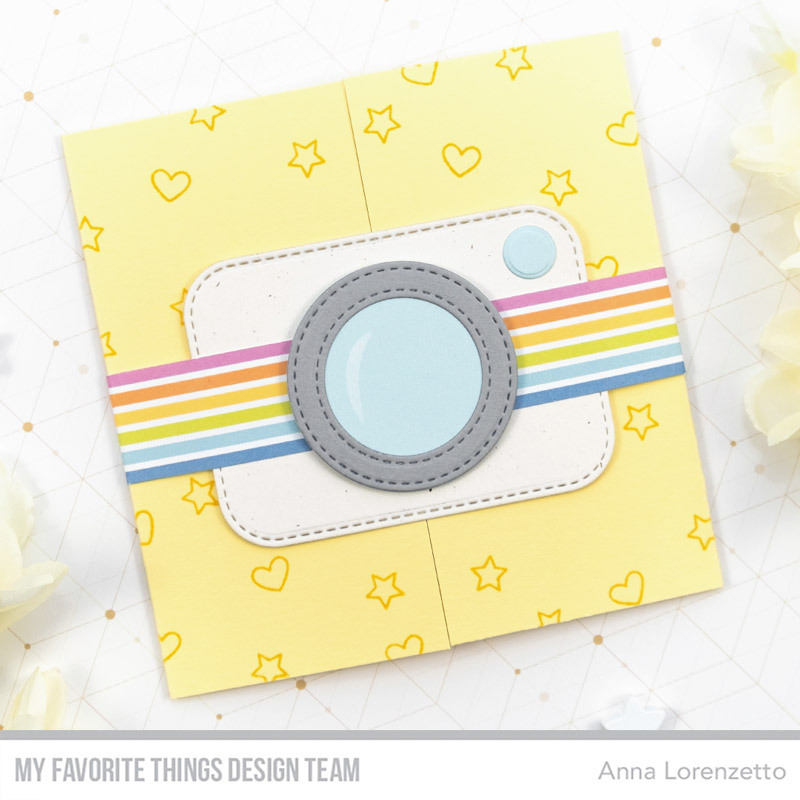 To start, I created a square gatefold card using MFT Lemon Chiffon card stock and randomly stamped some tiny hearts and stars (from the BB Picture Perfect stamp set) on it with Pineapple dye ink. Then, I die-cut two fishtail element out of patterned paper and adhered their folded edges of each to either side of the gatefold card, interweaving the end of the fishtail elements. And ta-dah! The card is ready to reveal a funny surprise when opened. I also created a small camera and used a strip of patterned paper to create a little belt that slides over the card to keep it closed. I die-cut a rounded rectangle out of Primitive White card stock using the Stitched Rounded Rectangle STAX Die-namics to create the camera body and die-cut a couple of circles, using the Stitched Circle STAX Die-namics to create the lens. Finally, I heat embossed the sentiment in white on a strip of Lemon Drop card stock and added it below my shutter aperture. Make sure to head over to the MFT Blog for a closer look at the beautiful new products revealed today and more ideas using them!